Beispielbild CETAF summary of state of play Anton Güntsch Freie Universität Berlin Botanic Garden & Botanical Museum Berlin-Dahlem Dept. of Research and. 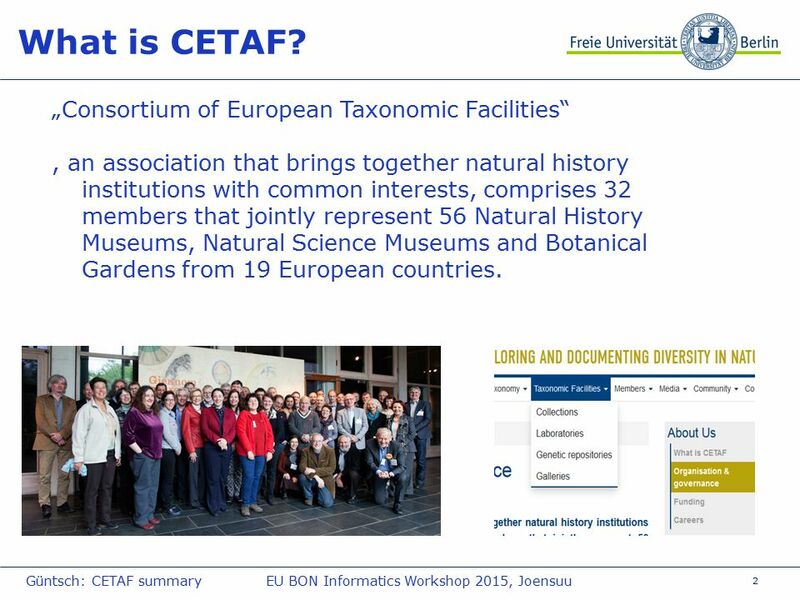 3 3 What is CETAF? 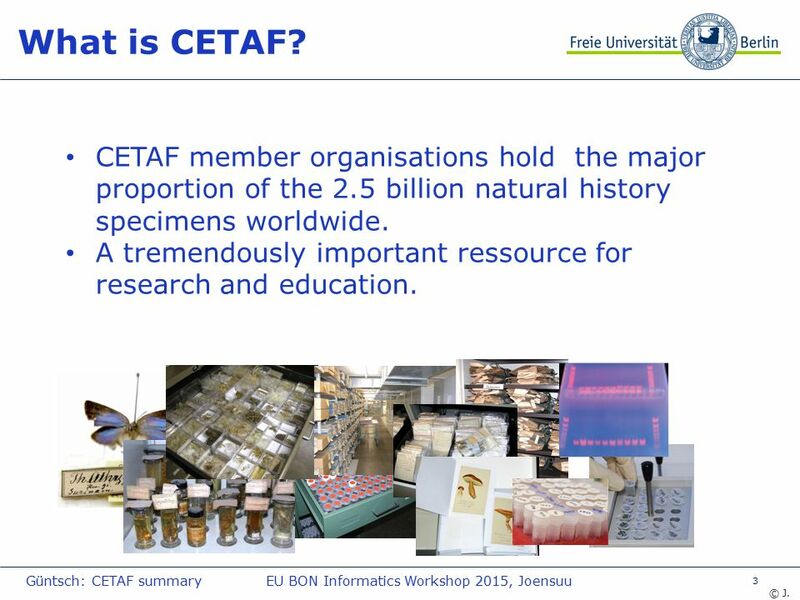 CETAF member organisations hold the major proportion of the 2.5 billion natural history specimens worldwide. A tremendously important ressource for research and education. 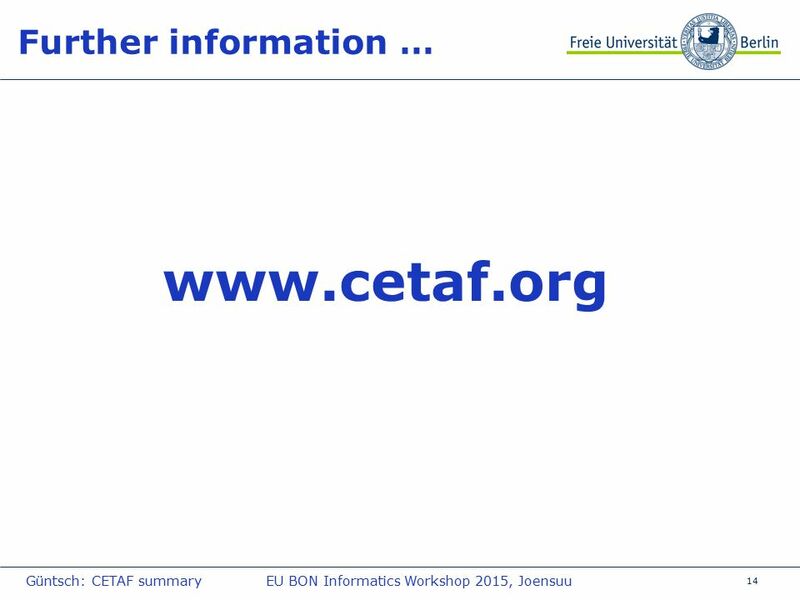 Güntsch: CETAF summaryEU BON Informatics Workshop 2015, Joensuu © J. Holstei n et al. 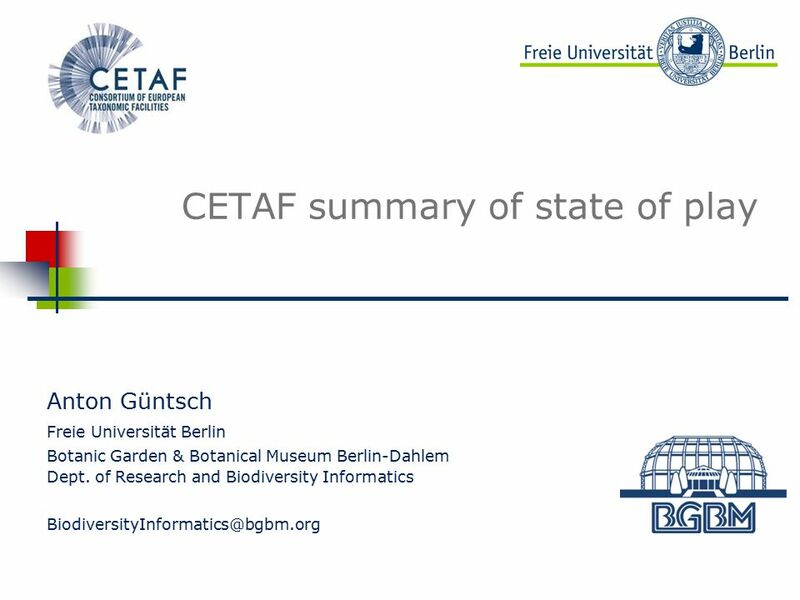 Download ppt "Beispielbild CETAF summary of state of play Anton Güntsch Freie Universität Berlin Botanic Garden & Botanical Museum Berlin-Dahlem Dept. of Research and." 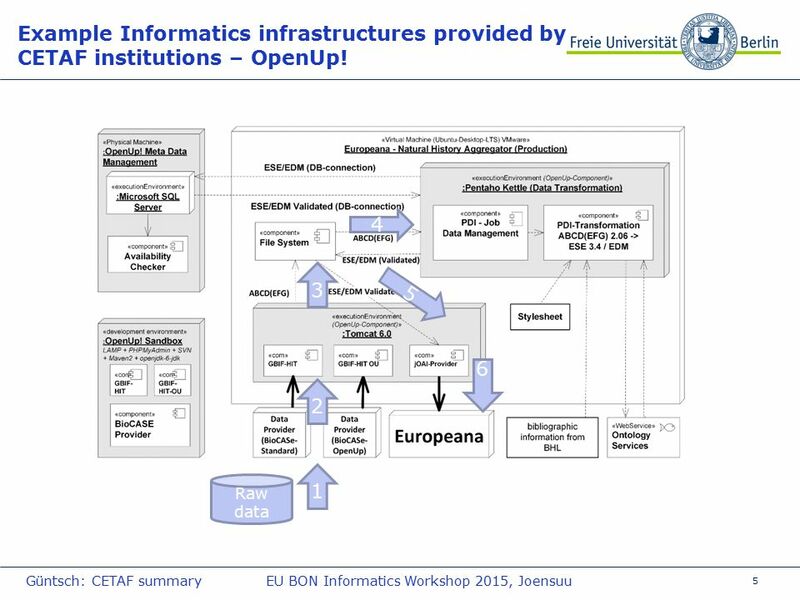 Digital Preservation An European perspective … Carlos Oliveira European Commission DG INFORMATION SOCIETY and MEDIA Dir. Web service registration Anton Güntsch FUB-BGBM. 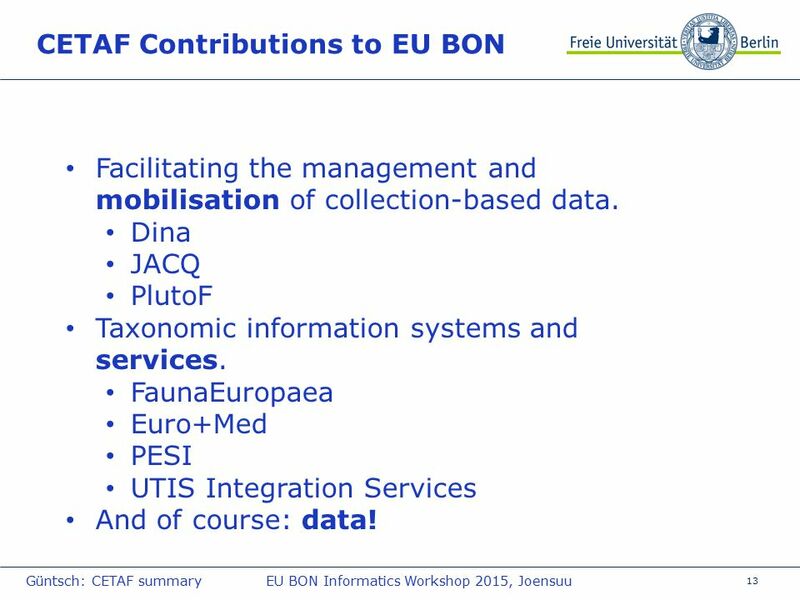 Collection Specimen URIs as Services Do we want other systems to discover, harvest, and re-use our collection. CCPA Annual General Meeting, Rotterdam 6 December 2011 Henning Scholz, Museum für Naturkunde Berlin & CCPA Secretary Proposal for Change to the CCPA. The SYNTHESYS Specimen and Observation Portal Kelbert, P., Holetschek, J., Güntsch, A., Kusber, W.-H., Zippel, E. & Berendsohn, W.G. Freie Universität. 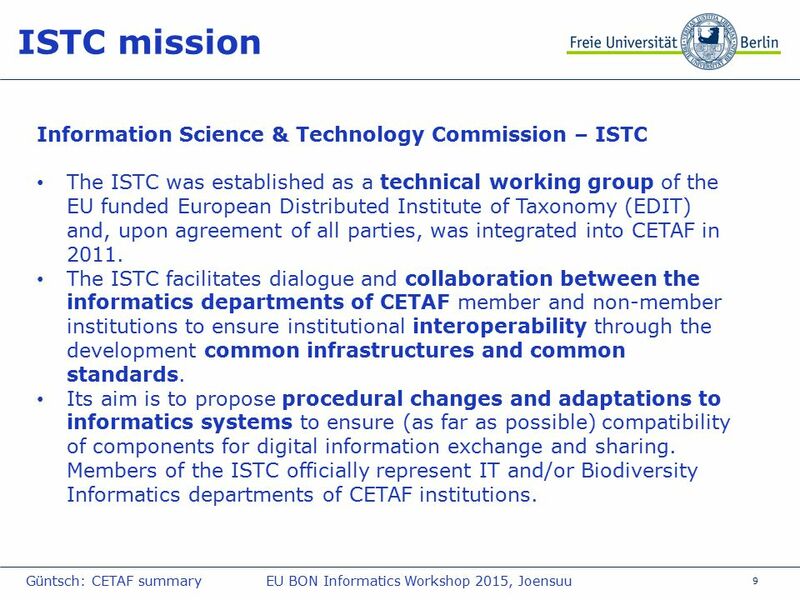 Beispielbild The EDIT Platform for Cybertaxonomy Anton Güntsch Freie Universität Berlin Botanic Garden and Botanical Museum Berlin-Dahlem. OpenUp! Technology Developments Anton Güntsch (FUB-BGBM) Gavin Malarky (NHM) & Gerda Koch (AIT) Heimo Rainer (NHMW) Freie Universität Berlin Botanic Garden. OpenUp! General Overview. OpenUp! 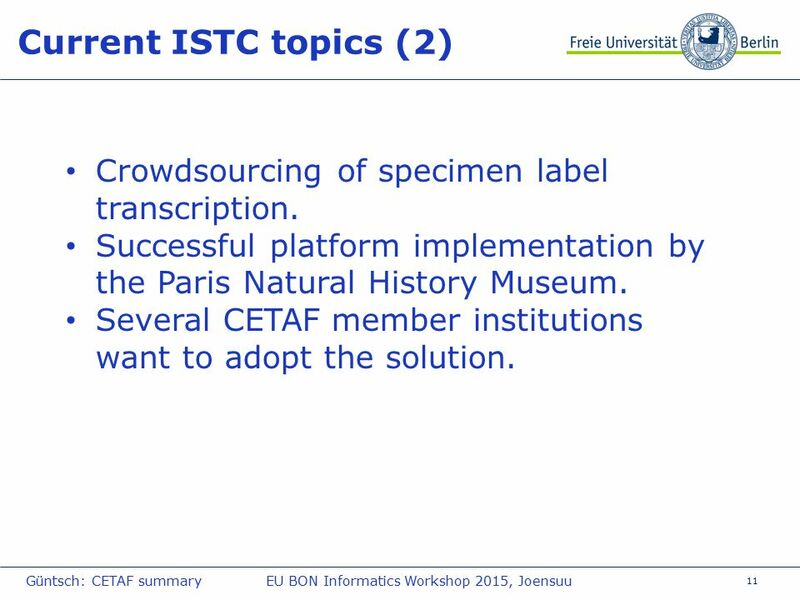 – What it aims at: Because access to multimedia resources from natural history collections in Europe. EDIT General Meeting Carvoeiro, January 2008. Beispielbild Stable identifiers: status and next steps Anton Güntsch Freie Universität Berlin Botanic Garden & Botanical Museum Berlin-Dahlem Dept. of. The DNA Bank Network Gabriele Droege Botanic Garden and Botanical Museum Berlin-Dahlem Freie Universität Berlin. 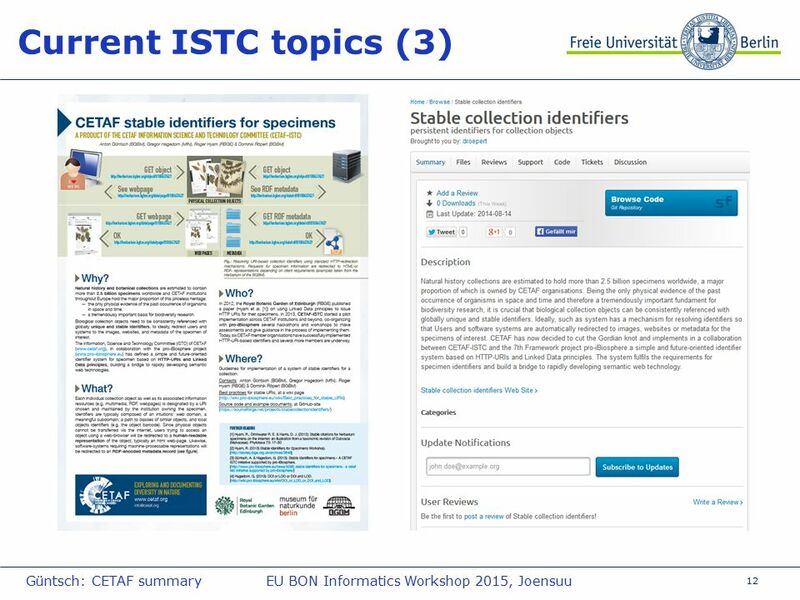 BGBM - Biodiversity Informatics04 June 2013 How the specimen data is organised and published at BGBM. OpenUp! 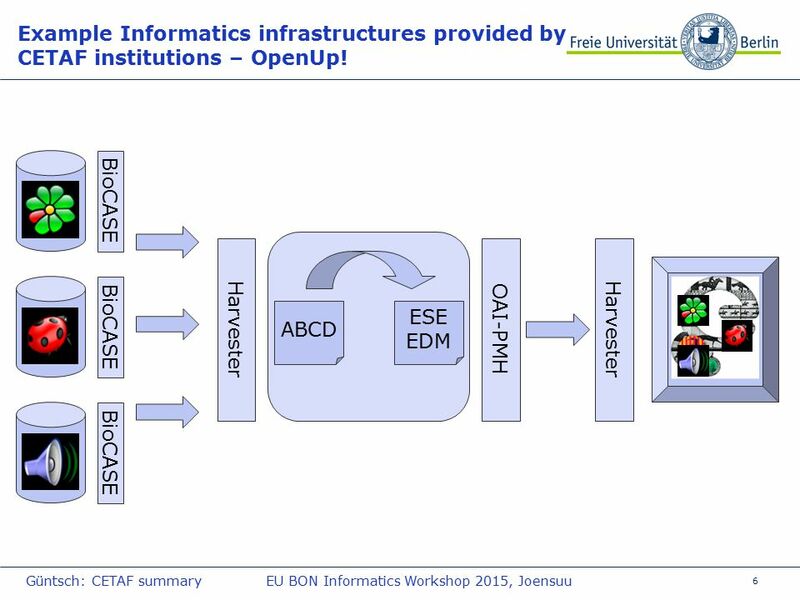 Creating a cross- domain pipeline Walter G. Berendsohn & Anton Güntsch Botanic Garden & Botanical Museum Berlin-Dahlem, Germany open-up.eu. 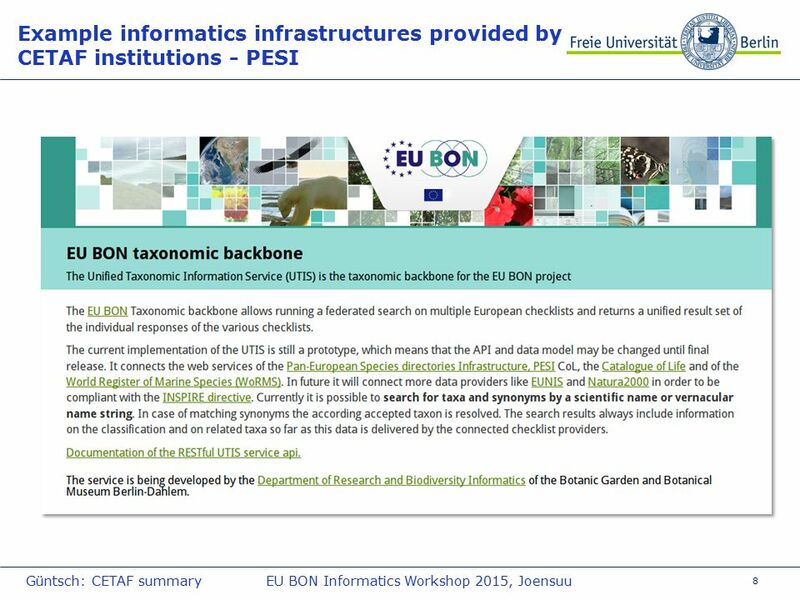 A project implemented by the HTSPE consortium This project is funded by the European Union SECURITY AND CITIZENSHIP EMPLOYMENT AND SOCIAL INNOVATION PROGRAMME. 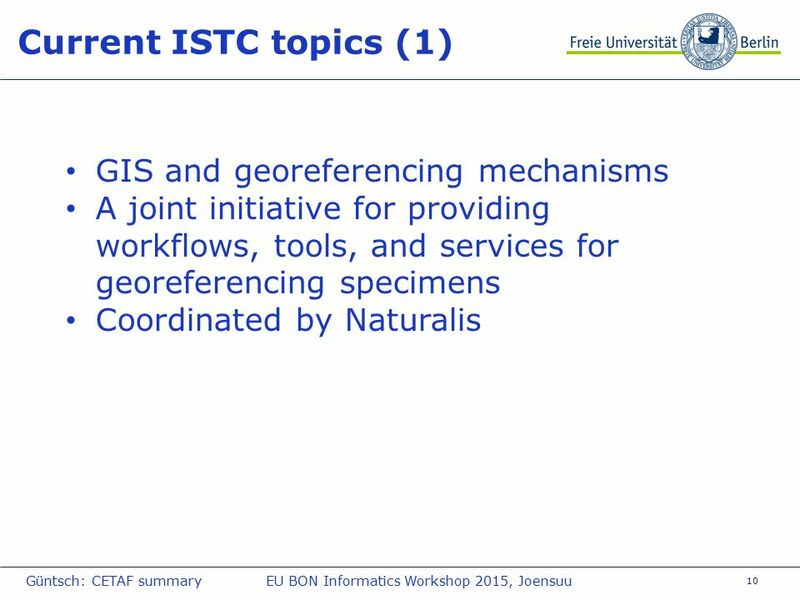 Irina Brake, Natural History Museum, London EDIT CDM portals and taxonomic editor – the Milichiidae portal. 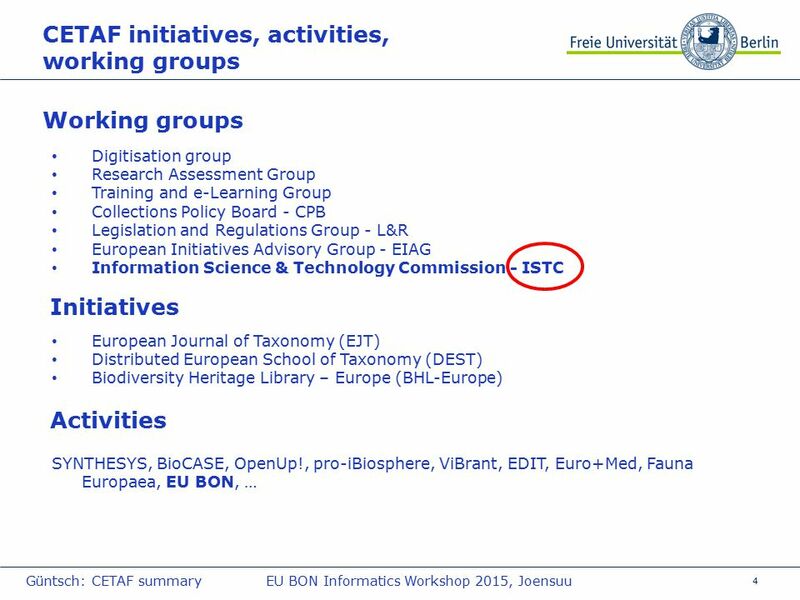 EU BON citizen science gateway Veljo Runnel University of Tartu Natural History Museum. 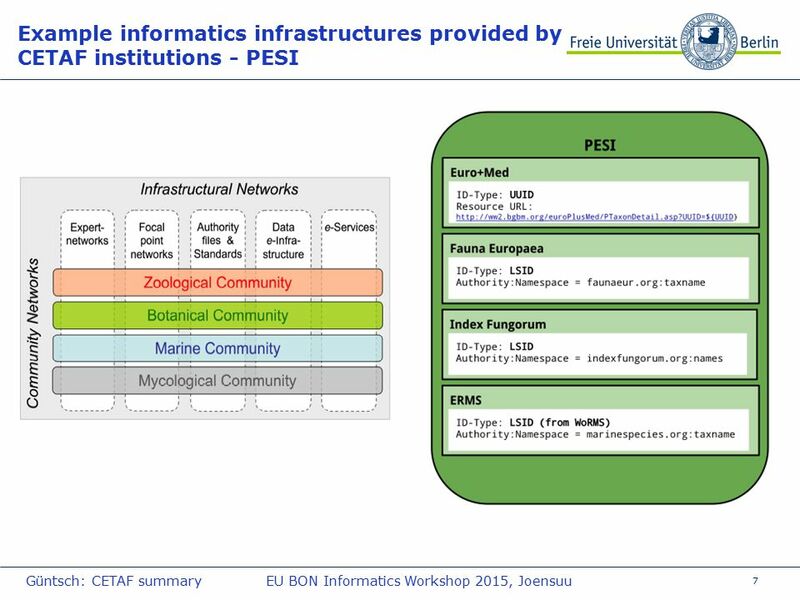 Building Sustainable Biodiversity Information Systems Fredrik Ronquist Dept. Bioinformatics and Genetics Swedish Museum of Natural History.